Cleans where chemicals fail. 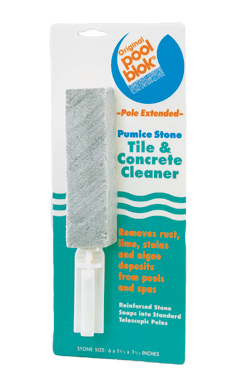 Removes lime, rust, stains and algae deposits from ceramic tile, molded and pneumatic formed concrete surface pools and spas. No need to drain pool. Chemically neutral. Won’t upset pH balance. Works through abrasive action. Ready to use. No gloves or applicators needed. Sizes for spot, surface and under water cleaning. The pole adapter fits all standard telescopic poles. Safe for skin. Safe around children and pets. 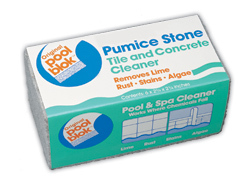 Available at participating pool supply outlets, food, drug, hardware, general merchandise and home centers.